Earlier in the year Africa in Words editors and authors attended Africa Writes 2013 in London. This literature and book festival organized by the Royal African Society hosted some of the most exciting names in contemporary African literature at the British Library for readings and panel discussions ranging across topics from new directions in African writing, to literary prizes, to the role of non-fiction, to digital futures. We were keen for Africa in Words to document and reflect on the festival, and for some of the conversations that took place to continue and reach a broader audience. 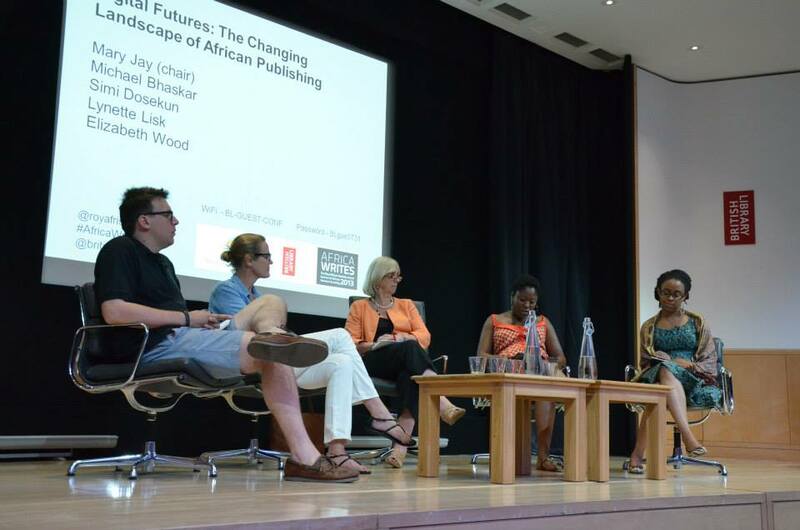 With that in mind we are delighted to be sharing a guest post by Emma Shercliff, reviewing a panel which focused on digital futures and the changing landscape of African publishing. Emma’s post not only gives an insight into the presentations given by each speaker, adding links to some of the important digital initiatives they highlighted, it builds on her own experiences of working in digital publishing and researching the African publishing industry to respond and reflect on the possibilities for the future of digital publishing in Africa. Panel discussion with Elizabeth Wood (Director of Digital Publishing and Mobile Platforms, World Reader), Lynette Lisk (Commissioning Editor, Pearson Education), Simi Dosekun (Former Managing Editor, Kachifo Limited), Michael Bhaskar (Digital Publishing Director, Profile Books). Chaired by Mary Jay (Consultant/Former Director, African Books Collective). This session on African publishing began with an informative overview of the global digital publishing landscape, presented by Michael Bhasker of Profile Books. Bhasker pointed to the different paths that digital publishing has taken in markets as diverse as the US, continental Europe, China and Japan, using the example of Japanese ‘keitai literature’ – novels written on and for mobile phones – to illustrate how new models are overtaking traditional book publishing as a means of storytelling, and creating major alternative revenue streams. Panelists left to right: Michael Bhaskar, Elizabeth Wood, Mary Jay, Lynette Lisk & Simi Dosekun. Lynette Lisk then offered a snapshot of her role at Pearson, where she commissions both fiction and educational material for East and West Africa. Lisk commented on the changes that digital technologies have made to her daily working life; she now receives the majority of manuscripts submissions via email and can instantly exchange editorial and artwork files with colleagues in Africa. Lisk was careful to highlight the major gap between what is technologically possible and the reality on the ground. She cited included low income, poor internet connectivity, absence of secure payment systems, piracy and a lack of teacher training in digital products as particular problems. Lisk noted that many schools she visited on a recent trip to Lagos did not have reliable electricity supplies and that there was a vast divide between the private and government schools. Lisk referred to Pearson’s current project to digitise the iconic African Writers Series as both ‘exciting and challenging’. Whilst providing a platform for new African writers to share their writing, it has not been possible to convert some of the most popular titles due to the lack of ebook rights. Lisk also mentioned that she had been disappointed by the quality of self-published manuscripts she had received, a theme that was to recur later in the session. This was a refreshingly honest assessment of the opportunities and challenges faced when publishing for the African market. Elizabeth Wood gave a presentation about World Reader, a non-profit initiative founded by ex-Amazon.com executive David Risher and marketing director Colin McElwee in 2010, with the aim of distributing ebooks in developing countries via eReaders and mobile phones. Wood began by stating that ‘our mission is to make sure that every man, woman and child on the planet has access to the books they need, to learn to read, to become literate, and to fall in love with books and fall in love with reading’. I must admit that the skeptic within me was wincing at the altruism of this aim, not least because Wood’s mention of Kenyatta’s campaign promise to ‘put a computer in the hands of every first grader in Kenya’ reminded me of the early days of the One Laptop Per Child (OLPC) initiative. However, unlike OLPC, which has been much criticised for its high-handed approach, Wood showed sensitivity when describing her work with African partners and with publishers. Particularly encouraging was her focus on the importance of providing relevant local content and the need to build sustainable revenue streams for African authors and publishers. Each eReader (an Amazon Kindle) is loaded with hundreds of storybooks donated by international authors, but WorldReader also works with publishers to provide African language titles and to digitise local materials, such as government textbooks. Importantly, the locally authored content is paid for, with authors receiving fees on a royalty basis. The statistics are impressive: WorldReader’s website states that, as of September 2013 they have put over 721,129 ebooks into the hands of 12,381 children in nine African countries. Feeling Wood’s portrayal was slightly too good to be true. I asked about a report I had read on the WorldReader website that over 40% of the eReaders in a pilot in Ghana had broken during the trial. Wood replied that this had been a big unforeseen problem, but that the broken devices had been replaced, and Amazon had designed a new way of reinforcing the screen. A combination of product design changes, the addition of rubberised skins to the devices and student and teacher training had reduced breakages to about 3%. Wood emphasised the importance of training (another contrast to OLPC, whose ‘give-a-kid-a-laptop-and-walk-away’ approach has been widely discredited), stating that some of the initial breakages had occurred by pupils sitting on the devices with the aim of keeping them safe! User feedback appears to be taken seriously and the baseline research and pilot reports suggest that WorldReader is paying considerable attention to the monitoring and evaluation of their initiatives, which will be vital to measure the impact of the project on literacy levels. Finally, Simi Dosekun, formerly Managing Editor at Nigerian publisher Kachifo Ltd. (and whose own children’s book, Beem Explores Africa, is amongst those provided on the WorldReader) gave an update on digital initiatives in Nigeria. Dosekun mentioned Okadabooks, a platform on which authors can self-publish their stories and from which readers can download stories to Android devices. The name reflects the okada motorcycles that navigate Nigeria’s busy streets, with its founder wishing to provide a ‘cheaper, faster and more flexible alternative to conventional means of transportation’, bypassing the ‘traffic jam’ caused by poor distribution and high printing costs of traditional books. Authors send in an electronic (jpeg) version of their story and, if approved, it is published (with no revisions) to the Okada platform. Books cost between N75 (30p) and N375 (£1.45), with authors taking a 50% royalty on all sales. 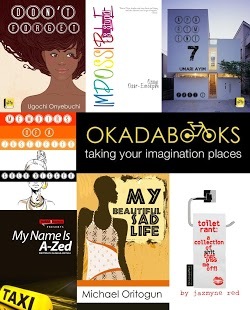 Okadabooks provides an innovative model, and undoubtably will help provide visibility to authors, but does raise the issue of editorial quality control. Dosekun also described a pilot taking place in Osun state, where the state governor was planning to give out 150,000 tablets pre-loaded with educational content to senior secondary school students. I researched this a little further: the Opon Imo initiative was launched in May 2013 by Governor Aregbesola. Each tablet is pre-installed with a virtual learning environment containing an e-book library, video tutorials, lesson notes and exam papers for the core subjects in the West African School Leaving Certificate Exam. Although both praised and criticized within Nigeria, this initiative provides groundbreaking example and it is hoped that publishers working directly with the state government will significantly reduce problems of distribution and piracy. My one serious reservation is the governor’s claim that he will save 50 billion naira ($314m) by using electronic tablets rather than printed books. Having managed a digital publishing unit, I would argue that although physical printing and distribution costs are indeed saved, the expense of technical development, hosting, bug fixes, digital rights management, platform maintenance and training, as well as editorial and production costs, should not be underestimated. The potential impact on educational attainment, as well as costs, of the Opon Imo initiative – like the eLimu project in Kenyan primary schools – will be fascinating to watch over the coming years. Dosekun’s examples of home-grown African digital ventures provided a welcome balance to the accounts of the initiatives which UK and US-based publishers and NGOs are taking to Africa. As Chair Mary Jay summarised, the two overarching themes running throughout the presentations were new business models and quality control. Michael Bhaskar stated that UK publishers have allowed themselves to be completely dominated by the large West Coast platforms and suggested that the challenge is for African entrepreneurs to build digital publishing networks themselves, before Amazon or Google arrive. There are opportunities for African developers – but the time to act is now. The panelists concluded that digital technologies do democratise publishing to some degree, but Bhasker argued that in an era when huge amounts of self-published content are being created, the value of the publisher is greater than ever. Members of the audience voiced concern that this might mean publishers continuing to exert too much control over what is published. However, as Dosekun pointed out, who wants to read a story full of errors? Perhaps inevitably, given the short timeframe of the session, there was no time to discuss many of the other exciting digital initiatives taking place across the continent. There is little doubt that platforms and apps such as 3Bute, eKitabu and Paperight are revolutionising the way that fiction is produced and consumed within Africa. Ventures such as The Kwani? Manuscript Project and Short Story Day Africa are administered entirely online; successful business models – such as the print-on-demand model developed by the African Books Collective – are already being used to distribute the work of African writers within the continent and internationally, and to keep books in print. Although lack of access to credit cards and secure payment systems remain challenges, digital initiatives are already starting to increase readership, and the fact that African consumers are using the mobile devices already in their pockets rather than waiting for the technology to arrive is the revolutionary factor. Problems that have bedeviled the African publishing industry for decades – poor road distribution networks, high printing costs, customs and trade barriers, the dominance of the large multinational publishers, territorial rights – are rendered irrelevant in a digital world. Local language publishing becomes a real possibility without the need for a minimum print run or warehousing facilities. Sales data can be instantly collected online, and authors appropriately compensated. This is a hugely optimistic time for African writers, readers and publishers. Reliance on donor funding has skewed the indigenous publishing infrastructure within Africa to the point where the whole industry revolves around lucrative textbook contracts (a 1999 APNET study estimated that over 95% of the publishing on the continent is educational). However, if projects such as WorldReader or Okadabooks can open up genuinely new distribution channels for literature within Africa, then a sustainable literary publishing sector could be built. Ultimately, the real test of digital technology is the impact it makes on the lives of individuals. When undertaking research at the Archives of British Publishing & Printing earlier this year, I came across a handwritten letter from two Tanzanian schoolgirls, dated February 1989. The girls, named Sofia and Anna, had written to Heinemann asking to how they could get hold of books in the African Writers Series. Their note, asking the publisher to send a list of ‘all the books you sell at any level’ and ‘to tell us the echanging rate in shillings and of dollars also how much if we want to pay in pounds’ perfectly illustrates the difficulties of procuring literature, particularly literature in English, in Africa in the late 1980s. Contrast that with the story Elizabeth Wood related, of a young reader in Africa today (she didn’t name the country). A young woman tweeted that she had finished reading My Guy by Chuma Nwokolo on WorldReader. Wood replied that there was another story by the same author on the platform. The young woman asked for the name of the title, which Wood supplied: Gluttony. Six minutes later the reader tweeted ‘I’m reading Gluttony on WorldReader’. What a tantalising glimpse of Africa’s digital future. 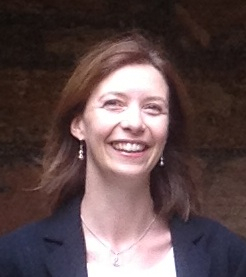 Emma Shercliff holds an MA in International Development & Education from the Institute of Education (University of London) and will be beginning a PhD in 2014. Her research focuses on the role and contribution of women within the African publishing industry. She was formerly Managing Director of Macmillan English Campus, a digital publishing division of Macmillan Publishers. She is the Vice-Chair of World Computer Exchange, a global education and environmental non-profit which aims to connect young people in developing countries to the skills, opportunities and understanding of the Internet. She will be based in Abuja from January 2014. I was very interested to read this Digital Futures report. Those that are following the current print vs. digital debate in Africa, the use of ebook reading devices, and the activities of WorldReader and other new projects and initiatives, may also be interested in an article “Print vs Electronic, and the ‘Digital Revolution’ in Africa” freely accessible at http://independent.academia.edu/HansZell. An update – examining the latest developments and new digital initiatives – is due to be published sometime early next year, and will also include an expanded literature review. That is quite interesting, You’re a very competent blogger. lot more of the wonderful post. Additionally, I’ve contributed your site within my internet sites!